Kenji Kasen (Japanese: 加瀬健治, Kasen Kenji) is a character in the Grand Theft Auto series who appears as a supporting character in Grand Theft Auto III (set in 2001). He is the brother of Asuka and Kazuki Kasen, and the co-leader of the Yakuza alongside his sister Asuka. He is also the brother-in-law of Toshiko Kasen and may be the father of Yuka, Asuka's niece. He is voiced by Les J.N. Mau, who has also appeared in television shows such as Law & Order. Kenji Kasen was born and raised in Japan with his siblings Kazuki and Asuka, joining the Yakuza gang before moving to the United States in 1996. He moved to Liberty City in 2001 and opened his casino, Kenji's Casino, in Torrington, the same place his brother Kazuki had owned his casino. Kenji joins his sister in becoming the co-leader of the Yakuza and begins to employ Claude on advice from his sister. He has Claude prove himself, despite Asuka's assurances, and, due to his fierce belief in loyalty, has him break Kanbu out of prison. Kenji, impressed with Claude's ability, has him collect three sports cars and deposit them in a garage, ambush a deal between the Colombian Cartel and the Uptown Yardies, collect briefcases of protection money and kill many members of the Uptown Yardies who were selling the drug SPANK. Claude later begins to work for media mogul Donald Love who employs him to kill Kenji whilst posing as a member of the Colombian Cartel, driving a Cartel Cruiser, in order to drive down property prices. After his death, Kenji's sister Asuka launched a full scale war against the Colombian Cartel that resulted in her death. 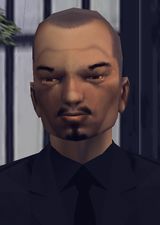 The player can kill Kenji before completing all of his missions, which will result in the player not being able to gain one hundred percent completion of GTA III. None of Kenji's missions are required to complete the main storyline of GTA III. Kenji's daughter or niece, Yuka. This page was last modified on 9 July 2014, at 21:53.